Well, you know, some people feel the need to trash the work of others to make themselves feel better about what's lacking in their own lives. First Blush in all its superb iterations is one of my fall favorites; it always goes up in September. Thanks, DMT. And thank you, Ryan! I have been a lifetime member of DB for about ten years now, and I can say unequivocally that your work is second to none, and how someone -- anyone -- can call your work pathetic is simply beyond me (@tina). Yes, it was four years ago, but still, I read her comment and my heart really went out to you, Ryan. The point isn't even what kind of tree that is. It could have been a tree of your own invention. There are no rules here. You create worlds and scenes that, as far as we know, do not exist in reality, so what purpose did Tina have in saying what she said. She has probably moved on with her life and has forgotten all about this little evil moment of hers, but I wanted you to know that you are an artist of the first caliber. Your mind sees something, and you create it. I highly suspect that this woman could do a tenth, a hundredth, of what you have accomplished in these scenes of yours. You've created impressions of worlds that are mysterious, glorious, daunting, exciting, moving, and evocative in any number of ways, and how someone could form the opinion that your work is pathetic is just so far beyond understanding and untenable that the issue is more about Tina's evil and corrupted spirit than it is about your work. She is the personification of all that is spiteful and ugly in this world, while you and your brilliant mind and pure heart represent all that is good and wonderful and perfect. Yes, the comment is four years old, but, frankly, I still had to say something. Words hang in the air. They don't just disappear. They cling to us, like cobwebs, and sometimes a memory is evoked simply by way of a word. I can remember things from my past that, for all pretense and purposes, I should have long since forgotten because the event or circumstance they represent have no significance in my life. But I remember useless scenes, and they stay with me, for no reason at all. And just in case Tina's words have stayed with you, I want you to know that you are a good and decent man, anyone can see that, and your heart is decent and good. You walk with the goodwill and hopes of all who have ever seen your work. You are blessed. And you are loved. another wow; beautiful subtle tonality - just lovely. Catches that first "yikes" moment just perfectly. The colors, the light, the content are serene, peaceful, calming. It's one of those scenes one wouldn't mind stepping into; ala 'The Twilight Zone' But the 'Zone' story as usual, has a strong and ironic twist. It's a story about a man who wants to escape into a painting ( a man fishing on a lake) and he visits the gallery everyday, wishing, hoping he can escape into that place and time. He is a nazi who escaped from the war and wishes to hide. He is discovered, runs to the gallery and wishes himself into the painting, but unknown to him the painting has been replaced by a different one. A man being crucified. Not that this compares to that, it is just such a peaceful idlyic scene, place and time. You have captured that photographic quality, light and ideal time of day. Thank you. The longer I look at this one, the more I appreciate it. The foreground vegetation, especially, is really well done, IMO. Might be the best ground cover of any of your renders--it just looks real! This is perhaps my favorite one yet in my 12 years of following DB. I used to live in NE Iowa, Decorah, and have seen many an autumn pasture just like this. You really capture the sense of those secluded paradises tucked away along gravel roads whose beauty often goes unnoticed until you stop and take a closer look. Wonderful! Thank you. Let me know if you are still seeing the gibberish. note: this happens on every preview.shtml page, not just firstblush. I am using FF3.6 (I can't handle FF's new layout so I can't upgrade). I also use adblock to remove a considerable amount of undesired content around the net (including things like Facebook/Twitter widgets like you use here, etc. ), which may or may not be interfering with it. is there anyway I can get the 3840x1080 in split files? Otherwise I have to have a reverse picture with the colored tree on the left instead of the right. Is there another way to fix this? Thanks for the heads-up! The files should have the correct links now. I think some of the multiscreen pickle jar renders all point to the same version (with the brighter red tree), the filenames are the same for the bigger images. Is that intended? My pick is #4. Each year my eye is suddenly drawn to just such a tree as I travel to/from work in autumn, somehow it seems to change colors overnight. You've captured this image perfectly, Ryan!! This is one sight that I look forward to as the seasons change here in southwestern PA. I've posted multiscreen versions of #4 and #2 (in the Pickle Jar). You will notice that the color pattern on version 4 is a bit different than the single screen version. Since I used Photoshop to create the effect in #4 it would be difficult (but not impossible) to replicate exactly. I chose instead to create a new distribution. Hope you like it! The multiscreen is finished rendering and now I am putting together the different foilage renders. It should be up later today! Ryan, I would have to say this is spot on! It looks just like the Vine Maple we have here on the west side of the Cascades Mountains here in Oregon. These wallpapers exemplify why this is my wife's favorite time of year. She loves the foliage color changes…especially the Vine Maple!! I'm sure she will have this set as her desktop wallpaper by the end of today! Never mind, it's already in there! I just needed to Ctrl+F better. If it isn't too much work could I get a 480x800 version of First Blush #2 for my Windows Phone? That one is my favourite! The previous desktop and this one are a reminder for me to keep renewing my membership. Just what my workstation needed for the warm and colourful Autumn now enveloping England. Thank you. I like the contrast best with the second one. I am actually very excited to see which one is ultimately selected as the "official" version. We get fog for a lot of the morning here in Southern California and this picture captures it perfectly. Once again you have dome some spectacular work!! I knew there was a good reason I despised "social" networking sites. I am personally glad I never fell into that particular addiction, but I certainly understand your frustration, Ryan. But once my local bank and supermarkets started adding "Like This" links to their pasta and Free Personal Checking, I figured it couldn't go anywhere but down from there. Just like I remember the days when MTV actually played Videos! @tina - just wow. At least be clear when you're scathing. I have no idea what the heck your criticism even was supposed to be. This looks a lot like our yard (we live on a farm). We have a small odd-shaped tree that comes out first every Fall. I like #4, but #3 really is first blush. Perfect for the coming fall! I love maple trees! I was going for a maple tree here. Actually, my grandparents have a young maple tree that looks very much like that. It turns to it's fall colors sooner than any other tree on the street, and it's tall and slender. Almost exactly like the one in the picture. I dont mean to contradict you, but the enjoyment of the image is in the art, not so much the realism, at least for me. Pathetic. What Oak, or whatever that tree is, looks like that. Good attempt at a survival statement, but pathetic. I like the current version (4th) better, it beast the 2nd one. I really like the realistic colors in the fourth one, but version 2 remains my favorite. I still really like 2 but 4 does grow on you and like he said it looks more real. When I first saw 2 I thought it looked a little unreal because of the solid red. I think you've won me over with the brighter colors, but I do also still like 2. I was sure that the 2nd one would be my pick, but the more I look at this one, the more I like it. It adds a touch of realism to it, in that it definitely feels like it's in the midst of changing, as opposed to being dead. Heh. I also think it still retains enough "pop" to hold true to the original idea. So I think that either 2 or 4 would be proper additions to the gallery. Actually the different variations look like the same scene over the time of foliage change. Awesome stuff, Ryan! firstblush3 looks the most realistic and is my favorite version. The vari-colored tree takes the cake. Version 2. I like the almost overemphasized flaming red color. But then I also like the subdued v1 because it is more natural. v4 is nice too, but I think i'll stick with v2 for now. As others have said, the second (and to a lesser degree, the first) versions seem to capture your original vision best. Versions 3 and 4 take away from the "flaming" effect of that first tree changing colors. i like them all but I think you have captured the best with the last one. I've added one last version (for today) that retains more "fire" from the original but also varies the colors a little. Thanks for the great feedback! Agree with Justin B that this one falls a little flat after looking at the second one. Justin puts it right. The first two versions go with what I'm familiar with seeing here. Where you have one tree that changes colors quicker than the others. This one the subject does not stand out as much from the background. I don't feel like the most recent version fits with your original inspiration. Granted, only you know what you saw, but to me version 3 doesn't strike me as extraordinary. It's reminiscent of any ole woods this time of year. It's a gorgeous picture in it's own right, but it doesn't have the same feeling, or "pop", that the other versions have. The newest one, "eh, fall is coming". The original, "wow, look at that tree!" I just downloaded and voted for the 2nd version, and the third version just popped up. I like all THREE! This is a lot better than the original. The fog is nice too. I love the overall image, the colors, and the depth and serenity that the fog brings. Even without the fall tree this would be a lovely image. My one minor nitpick: the shape of the fall tree somehow seems unnatural to me, perhaps a bit to tall and slender? Just my opinion, though. It reminds me of a scene I saw just yesterday that was the opposite of this: a mountain hillside covered in trees of crimson, orange and gold, and in the middle was a grove of green trees, like the last holdouts of a surrounded army. Of course since those on-off trees like this one start to change as early as July, I might be having wishful-thinking-syndrome that it's late October in that scene. I've never liked fall, too much of a reminder that winter is coming. However, this really is lovely. Summer is still hanging around but the beauty of fall has come. The mist is a good touch as is brings to life the cold dew of the morning burning off as the sun rises. Your best fall picture ever!! Nice beginning of Autumn render! I like the second one better because the tree is brighter. I like that much of everything else is somewhat dark and mysterious. I like the ganja looking plants. I highly doubt you intended them to look like that. But really cool looking plants. Well done. When I decide to use a heavily distorted image as my desktop, I correct it in Gimp, but I would rather you did it since you have the artist's eye. Approximately what would be a time differential for you to put out a multi-display rendering of a work? Enjoy the work very, very much. Only wish you had more 'planetary' renderings. The red tree looked too dim in the first one. The second one matches the lighting better I think. Both versions are good, but I prefer the original render. The bush looks more realistic in that one. I think the fog gives it an almost dreamy feel to it. Without the fog it'd be a more conventional picture, and I think weaker for it. I've added a new render this morning which brightens the red tree considerably and moves it a bit more front & center. I know a number of comments have asked about removing the fog, but it adds a sense of depth that I feel is missing without it. The original is still available here for comparison purposes. I think it is a great idea, however, I feel like the upper part of the picture (especially on the right side) is too dark. I also think it would look better without the fog. Usually I got a fever and the only prescription is more cowbell, but in this case I think this render has just the right amount. ;) @ Samir: Always happy to meet another SNL fan who fondly remembers that Christopher Walken/Blue Oyster Cult sketch. I disagree with Samuel. I think the mist gives it a mystical appearance. ... Looks a little washed out, like there's too much white balance or something. The fog itself is perfectly fine, gives it a nice soft feel, but there needs to be a bit more contrast. And if you really want some interesting views like this, check out places like Eagle's Peak on the western Wisconsin boarder... it'll blow your mind this time of year. This looks fantastic on my monitor. The lighting is superb. 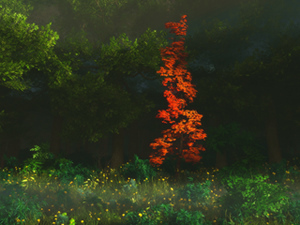 Deep, dark forest behind one blazing red tree. Really like the play of light. The green foliage and yellow daises upfront is perfect and very photo realistic. All of it combines to really show off the red tree. Don't change a thing on this one. I wonder if it looks too dark to some due to their monitor's gamma setting. I like the trees, but the fog makes it look...nasty. Just give us the forest! It would look gorgeous. What I find interesting is that this looks more like a painting whereas Elegy looked more photorealistic. I still like Elegy better. I think with the dark forest background the red tree needs to be even brighter, and loose the fog also. I agree with Chuck's earlier comment it's "Meh" and I'm not sure why either, I most always prefer your naturescapes, but somethings not quite right about this one. Wow! I can't exactly put my finger on what it is about this image that is so amazing. It has the feel of an oil painting, with the detail of a photograph. I don't know if it is the lighting or the subject matter, but I would say that this is the best image you have created to date. Can't wait for the widescreens. You could do an interesting initial winter version of this scene by making all of the trees that are currently green appear in deep rich fall colors, and the current red tree being the first one to have lost all of it's leaves. You could continue this idea with "First Green" by having the blush tree with the first blossoms of spring and all the other trees bare, etc . . . This has been a fantastic investment that has paid huge dividends. Keep up the great work! I love that you can go from something like String Theory to this. Definitely shows your wide range of abilities. Simplistic, highly detailed, colorful and elegant. I think it's a lovely addition. Thanks, Ryan! This reminds me of the first red tree I saw about forty years ago, in Maine, after growing up in autumnally-incorrect California. However, when I look at First Blush on my monitor, the red leaves seem to be "buzzing," almost like a movement. I can feel my eyes constantly trying to focus. I'm a life time member and I just wanted to take a minute to say thanks. You work displayed on my desktop always gets me complements and I love the vast library of works. Keep up the good work and I bid you and your family God's peace. I like the idea of the contrast in tree colour, but think if you made the background more dense, it would bring out the red colour in the tree a lot more. Also more fog in the foreground but remove it from the top would also compliment this idea. It makes it slightly more spooky but this render is all about the colour. I like your nature wallpapers, but I'm a little indifferent about this one. Unfortunately I couldn't tell you why, it's just my thought.